The Magic Paintbrush, also known as the Gaddbrush, is Bowser Jr.'s main weapon. It was created by Professor E. Gadd and is emblazoned with his logo. The Magic Paintbrush can create Graffiti that has many functions, such as generating Polluteds or acting as portals between locations. After obtaining the Magic Paintbrush from E. Gadd, Bowser Jr. uses it to paint Graffiti all over Isle Delfino, fill it up with hostile creatures, as well as disguise himself as Shadow Mario. Because of his disguise, Mario is believed to be the perpetrator and forced to clean up the Graffiti. Bowser Jr. claims it was given to him by E. Gadd as opposed to stealing it. Much of the game's enemies, puzzles, and hazards revolve around the goop created by the brush, which can take on caustic and elemental properties to damage Mario on contact. The brush's Goop is washed up using F.L.U.D.D., and by the time Bowser and Bowser Jr. are confronted for the final time, Mario has washed up nearly all of it. After the final battle, the Magic Paintbrush ends up on an island near Gelato Beach, where it is discovered by Il Piantissimo. Bowser Jr. uses the brush in Mario Power Tennis for both of his Power Shots; when his offensive shot (Magic Paint) is used, Bowser Jr. takes out his brush to color the tennis ball and create two duplicate balls of the same color before sending all of them back, and when his defensive shot (Rolling Brush Return) is used, he slides towards the ball and twirls the brush, hitting it back. The Magic Paintbrush appears as an item in Mario Kart Arcade GP, Mario Kart Arcade GP 2, and Mario Kart Arcade GP DX, though it is known as the Mustache Pen. It is a lock-on item, much like the Basin. Upon being hit by a Mustache Pen, a racer will lose speed, and their portrait will be obscured by silly graffiti such as a mustache or lips. A variant of the Mustache Pen known as the Triple Pen exists - this item allows the player to shoot three Mustache Pens in succession, though these do not lock on and can only be fired in a straight line, much like the Green Shell. 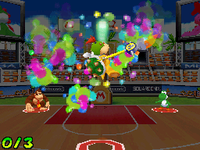 In Mario Hoops 3-on-3, the Magic Paintbrush is used in Bowser Jr.'s Special Shot, the Graffiti Shot. By dribbling in a "B" shape, Bowser Jr. throws the ball in the air and paints it with the brush. On the third brushstroke, he launches the ball to the net, leaving a trail of Goop behind it. The Magic Paintbrush appears in Bowser Jr.'s Special Shot in Mario Sports Mix. When activated, Bowser Jr. uses the brush to scatter paint around the whole court, causing people who walk on it to slide around and trip. In Mario Super Sluggers, the brush is Bowser Jr.'s bat. When he uses his Star Swing, Graffiti Swing, Bowser Jr. twirls his brush around and creates a duplicate paint ball. Both balls are then hit into the air, with the duplicate landing first and exploding; whoever is around the duplicate when it lands gets briefly stunned. When he uses his Star Pitch, Graffiti Ball, Bowser Jr. coats the baseball in graffiti before pitching it, blocking the batter's vision with goop. 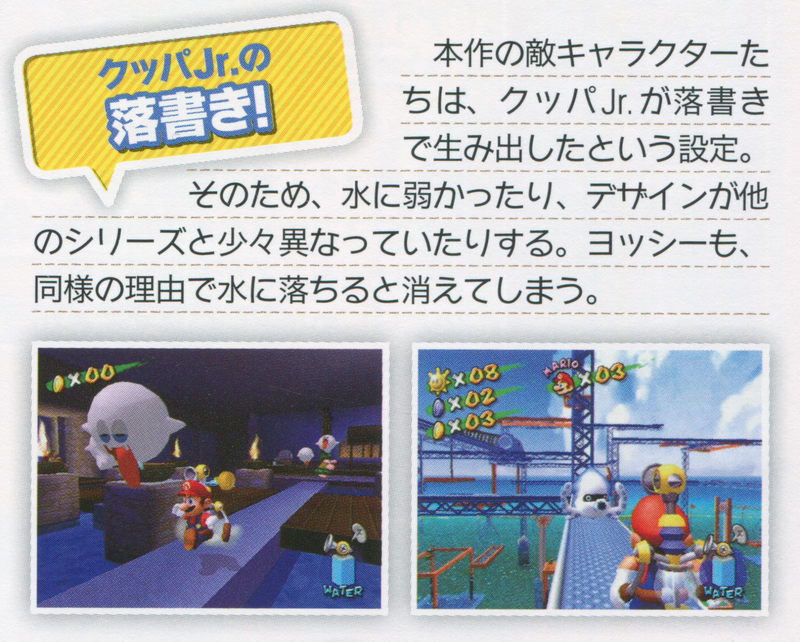 Bowser Jr.'s minigame, Graffiti Runner, also features the Magic Paintbrush, with four people competing for the brush to coat the floor in their respective color. The brush has a limited amount of paint, and when it's depleted, the brush is forced to be dropped, though it can also be knocked away. The Magic Paintbrush appears in Mario & Luigi: Dream Team as one of Bowser Jr.'s attacks during his boss battle with Mario and Luigi. He used the brush to tickle Mario or Luigi, stealing one of their Bros. Attacks in the process, though this doesn't create any Graffiti. The Magic Paintbrush makes an appearance in the Bowser Jr.'s Journey sub-mode of Mario & Luigi: Bowser's Inside Story + Bowser Jr.'s Journey. Bowser Jr. wields it when changed to ranged-type and uses it to sling paint at enemies. Morton Koopa Jr. had it under his possession for a while without Bowser Jr. knowing, causing the latter to scold him upon discovering this. In Mario Golf: World Tour and Mario Sports Superstars, Bowser Jr. uses the Magic Paintbrush in all his post-hole animations except for Par. He spins the brush around, splattering paint everywhere, and spreads it on the screen when he gets an eagle, albatross, hole-in-one, or bogey. In Super Smash Bros. for Nintendo 3DS / Wii U and Super Smash Bros. Ultimate, Bowser Jr., as well as the Koopalings, use the Magic Paintbrush in their Final Smash, Shadow Mario Paint. Using the brush, they transform into Shadow Mario and paint a giant Graffiti "X" on the screen, hurting anyone who touches it. After a while, the "X" explodes, causing even more damage to anyone next to it. The Inkbrush and Octobrush from Splatoon are very similar to the Magic Paintbrush and are used in a similar manner as the Magic Paintbrush was used in Super Mario Sunshine. In the Super Mario Mash-Up Pack in Minecraft, Dyes are replaced by Magic Paintbrushes. This page was last edited on March 8, 2019, at 12:59.